Our class website has won some wonderful awards! Thank you to each of the groups below that have taken the time to visit our site and present us with each of these awards. It is an honor to display them on our site. We thank you for inviting us to visit your home on the Internet. We applaud your site's ease of navigation, obvious hard work and valuable content. This award is for teacher's and/or classroom sites, representing class activities, student involvement and/or parent participation and is given to sites which represent the highest level of creativity and concept and that honor the webmaster's code of ethics. It is with great pleasure that we give you the Education Award. We have visited your site and found it to be a great educational resource. I love the section about your class pets! I tried that with rabbits once, but they were too messy! I'm sure your students love having the animals in the classroom, and it really does teach them a lot about living things and the care they require. I really enjoyed your photo gallery as well. Also, thank you for your service in the military. I read that you were surprised that you loved teaching the way that you did, but I'm glad that it worked out that way for you. I can tell that you have a passion for your job. It is reflected in the effort you have put into your website. Your website also qualifies for our Child-Friendly Website Award. Congratulations and thank you for providing content that contributes to education and is fun for children! You have been awarded the Teachers Website Excellence Award for your website: Mr. Smith Online. Your website was judged to be outstanding in design and an excellent resource for your students and their parents. Your website contained excellent resources for content and learning aids. Once again, congratulations on you achievements. The Blue Ribbon Website Award presented to Mr. Smith Online "The Blue Ribbon Website Award," established November 15, 1997, was created to honor and acknowledge the learning process, long hours, and sacrifices experienced in reaching the plateau of successfully establishing an internet website. congratulations for obtaining award number 06-051 for your dedication in presenting your website on the worldwide internet. Mr. Smith's Online is a recipient of The Teacher's Corner Honor Roll Award for School and Classroom web sites. Your web site is informative and contains great resources for students and parents. I visited your site (finally) and thought you did a superb job! Everything looked great! Hi David! Great site! I'd love to award you with my Outstanding Classroom award! Anyway, wonderful job and keep up the fantastic work! You have been awarded the Gold Cup Website Award (attached). Your website is well designed and contains a wealth of information for your students, their parents, as well as your fellow teachers. What a creative use of technology with your Xtranormal home page introduction! Many blessings to you and your students during the upcoming school year. They are fortunate to have you as their teacher! It's great to hear from you. Your son is absolutely adorable! Hope you've had a terrific summer. I am pleased to present you with the Gold Star Award for your outstanding website! Keep up the great work!!!! Please link this award back to my site at http://www.mrsvandyke.com. I have added your site to my list of award winners. Have a great rest of the summer!!!! While searching the internet for inspiration, it's nice to come across a website that is a gem. Your website is a real treasure, not merely a diamond in the rough! That's why you have been chosen to receive the "Real Treasure Award" from MyFunTeacher.com. As a website designer, I know that it takes a lot of hard work to build and maintain a website. That extra commitment to your students and their families should not go unnoticed! website represents you as a teacher and that is something you should be proud of! Thank you for sharing your classroom with us! 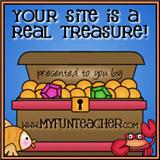 Your site will be featured on MyFunTeacher.com’s "Real Treasures Award Page". Keep up the good work! Congratulations! Your site has met the requirements for the Learning Abilities Books Award. You have gone the extra mile in providing helpful educational content for visitors. Your site is attractive, professional, and easy to navigate. You are careful to give credit for copyrighted materials. I enjoyed visiting and look forward to visiting again.Your site is on the "Classroom Awards" page and the "What's New" page of The Learning Abilities Books Site. Congratulations! 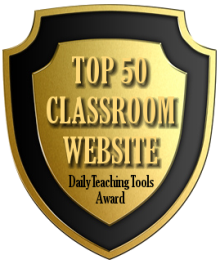 Dale Borgeson, a third grade teacher in California, has nominated your classroom website for one of our awards. It's my pleasure to announce that your site has been accepted. xtranormal animations, online surveys, and slideshows to name a few. The drop down navigation links are a nice touch."